11 Apr 2019 --- An international consortium has sequenced the entire genome of durum wheat – the source of semolina for pasta and a food staple for the world's population, according to an article published in Nature Genetics. The team has also discovered how to significantly reduce cadmium levels in durum grain, ensuring the safety and nutritional value of the grain through selective breeding. The durum wheat genome is four times as large as the human genome. For the first time, researchers have assembled the complete genome of the high-quality Svevo variety. “This ground-breaking work will lead to new standards for durum breeding and safety of durum-derived products, paving the way for production of durum wheat varieties better adapted to climate challenges, with higher yields, enhanced nutritional quality and improved sustainability,” says Luigi Cattivelli of Italy's Council for Agricultural Research and Economics (CREA). “We can now examine the genes, their order and structure to assemble a blueprint that provides an opportunity to understand how the genes work and communicate with one another,” says wheat breeder Curtis Pozniak from the University of Saskatchewan (USask). “With this blueprint, we can now work quickly to identify genes that are responsible for the traits we select for in our breeding programs such as yield, disease resistance and nutritional properties,” he notes. The research involved over 60 scientists from seven countries. The work was co-ordinated by Cattivelli and included corresponding authors Pozniak and Klaus Mayer of the Helmholtz Zentrum in München (Germany), as well as researchers Aldo Ceriotti and Luciano Milanesi of Italy's national research council CNR and Roberto Tuberosa of the University of Bologna (Italy). “We can now see the distinct DNA signatures that have been so critical to the evolution and breeding of durum wheat, enabling us to understand which combination of genes is driving a particular signature and to maintain those target areas of the genome for future breeding improvement,” explains Marco Maccaferri, lead author of the manuscript. Durum wheat, which is mainly used as the raw material for pasta and couscous production, evolved from wild emmer wheat and was established as a prominent crop approximately 1,500 to 2,000 years ago in the Mediterranean area. The team compared the durum wheat sequence to its wild relative and were able to reveal genes that humans have been selecting over the centuries. The scientists uncovered a loss of genomic diversity in durum wheat compared to its wild wheat relative and they've been able to map these areas of deprivation and precisely recover beneficial genes lost during centuries of breeding. “Unlike in humans, durum wheat is a so-called polyploid and contains two genomes. How these genomes interact and coordinate their activities is a fundamental question that might also have an impact on food quality and yield,” explains Mayer. In a genetic discovery, Pozniak's USask team, along with University of Alberta scientists Gregory Taylor and Neil Harris, identified the gene in durum wheat responsible for the accumulation of cadmium, a toxic heavy metal found in many soils. “Now that we've identified this gene, we can effectively select varieties that do not accumulate significant cadmium in the grain – levels well below World Health Organization (WHO) standards which will ensure that our durum wheat products are more nutritionally safe,” comments Pozniak. Durum wheat is mainly cultivated in Canada, Europe, the US and South Asia. It also remains a key crop for small farms in North and East Africa, as well as the Middle East. 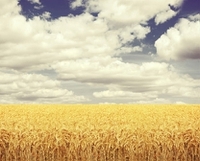 As pasta is a staple for the world's population, industries are asking for more, safer, and higher-quality durum wheat. “Having this durum wheat high-quality genome sequence enables us to understand better the genetics of gluten proteins and the factors that control the nutritional properties of semolina. This will help to improve pasta quality traits,” notes Ceriotti. Last month, research funded through IWYP (International Wheat Yield Partnership) highlighted the role of radiation use efficiency (RUE), how sunlight is converted into plant mass, in increasing the yield potential of wheat – and how we can increase plant biomass without sacrificing grain yield – which has previously been a significant challenge.